Phosphorus is a phosphate rocks. The first form of elemental phosphorus to be produced (white phosphorus, in 1669) emits a faint glow upon exposure to oxygen – hence its name given from Greek mythology, Φωσφόρος meaning "light-bearer" (Latin Lucifer), referring to the "Morning Star", the planet Venus. The term "phosphorescence", meaning glow after illumination, originally derives from this property of phosphorus, although this word has since been used for a different physical process that produces a glow. The glow of phosphorus itself originates from oxidation of the white (but not red) phosphorus— a process now termed chemiluminescence. Together with nitrogen, arsenic, and antimony, phosphorus is classified as a pnictogen. Phosphorus is essential for life. Phosphate is a component of detergents, pesticides, and nerve agents. Thermolysis (cracking) of P4 at 1100 kelvin) gives  At still higher temperatures, P2 dissociates into atomic P.
Violet phosphorus is a form of phosphorus that can be produced by day-long annealing of red phosphorus above 550 °C. In 1865, Hittorf discovered that when phosphorus was recrystallized from molten lead, a red/purple form is obtained. Therefore this form is sometimes known as "Hittorf's phosphorus" (or violet or α-metallic phosphorus). 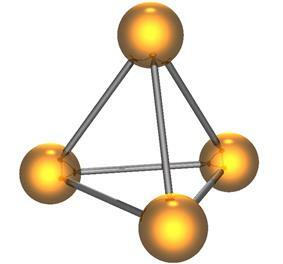 Black phosphorus is the least reactive allotrope and the thermodynamically stable form below 550 °C. 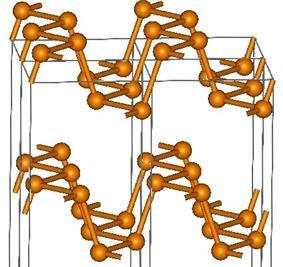 It is also known as β-metallic phosphorus and has a structure somewhat resembling that of graphite. High pressures are usually required to produce black phosphorus, but it can also be produced at ambient conditions using metal salts as catalysts. P, and that working directly over an open container be avoided in order to protect the eyes. Monitoring personal, clothing, and surface contamination is also required. In addition, due to the high energy of the beta particles, shielding this radiation with the normally used dense materials (e.g. lead), gives rise to secondary emission of X-rays via Bremsstrahlung (braking radiation). 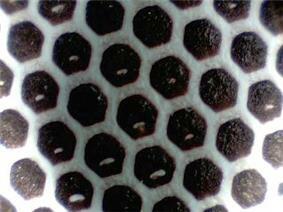 Therefore shielding must be accomplished with low density materials, e.g. Plexiglas (Lucite), other plastics, water, or (when transparency is not required), even wood. Phosphorus is not found free in nature, but it is widely distributed in many apatite (an impure tri-calcium phosphate mineral), is today the chief commercial source of this element. According to the US Geological Survey (USGS), about 50 percent of the global phosphorus reserves are in the Arab nations. Large deposits of apatite are located in China, Russia, Morocco, Florida, Idaho, Tennessee, Utah, and elsewhere. Albright and Wilson in the UK and their Niagara Falls plant, for instance, were using phosphate rock in the 1890s and 1900s from Tennessee, Florida, and the Îles du Connétable (guano island sources of phosphate); by 1950 they were using phosphate rock mainly from Tennessee and North Africa. In the early 1990s Albright and Wilson's purified wet phosphoric acid business was being adversely affected by phosphate rock sales by China and the entry of their long-standing Moroccan phosphate suppliers into the purified wet phosphoric acid business. Urine contains most (94% according to Wolgast) of the salts such as sodium chloride, which are also part of the wastes excreted by the renal system. The degree to which these factors impact the effectiveness depends on the term of use, salinity tolerance of the plant, soil composition, addition of other fertilizing compounds, and quantity of rainfall or other irrigation. Urine typically contains 70% of the nitrogen and more than half the phosphorus and potassium found in urban waste water flows, while making up less than 1% of the overall volume. Thus far, source separation, or urine diversion and on-site treatment has been implemented in South Africa, China, and Sweden among other countries with the Bill and Melinda Gates Foundation provided some of the funding implementations. China reportedly had 685,000 operating source separation toilets spread out among 17 provinces in 2003. "Urine management" is a relatively new way to view closing the cycle of agricultural nutrient flows and reducing sewage treatment costs and ecological consequences such as eutrophication resulting from the influx of nutrient rich effluent into aquatic or marine ecosystems. Proponents of urine as a natural source of agricultural fertilizer claim the risks to be negligible or acceptable. Their views seem to be backed by research showing there are more environmental problems when it is treated and disposed of compared with when it is used as a resource. It is unclear whether source separation, urine diversion, and on-site urine treatment can be made cost effective; nor whether required behavioral changes would be regarded as socially acceptable, as the largely successful trials performed in Sweden may not readily generalize to other industrialized societies. In developing countries the use of whole raw sewage (night soil) has been common throughout history, yet the application of pure urine to crops is rare. Increasingly there are calls for urine's use as a fertilizer, such as a 2010 Scientific American article "Human urine is an effective fertilizer". With metal cations, phosphate forms a variety of salts. These solids are polymeric, featuring P-O-M linkages. When the metal cation has a charge of 2+ or 3+, the salts are generally insoluble, hence they exist as common minerals. Many phosphate salts are derived from hydrogen phosphate (HPO42-). PCl5 and PF5 are common compounds. PF5 is a colourless gas and the molecules have trigonal bypramidal geometry. 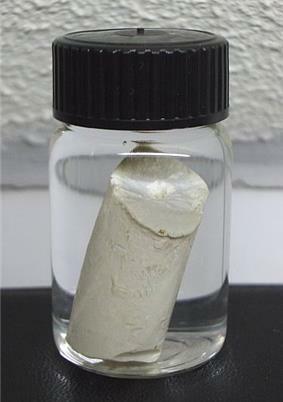 PCl5 is a colourless solid which has an ionic formulation of PCl4+ PCl6–, but adopts the trigonal bypramidal geometry when molten or in the vapour phase. PBr5 is an unstable solid formulated as PBr4+Br–and PI5 is not known. The pentachloride and pentafluoride are Lewis acids. With fluoride, PF5 forms PF6–, an anion that is isoelectronic with SF6. 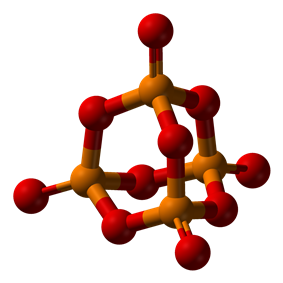 The most important oxyhalide is phosphorus oxychloride, (POCl3), which is approximately tetrahedral. The PN molecule is considered unstable, but is a product of crystalline Phosphorus nitride decomposition at 1100 K. Similarly, H2PN is considered unstable, and phosphorus nitride halogens like F2PN, Cl2PN, Br2PN, and I2PN oligomerize into cyclic Polyphosphazenes. For example, compounds of the formula (PNCl2)n exist mainly as rings such as the trimer hexachlorophosphazene. The phosphazenes arise by treatment of phosphorus pentachloride with ammonium chloride: PCl5 + NH4Cl → 1/n (NPCl2)n + 4 HCl The chloride groups can be replaced by alkoxide (RO-) to give rise to a family of polymers with potentially useful properties. The trifluoride is produced by from the trichloride by halide exchange. PF3 is toxic because it binds to haemoglobin. calcium phosphide, Ca3P2. Unlike ammonia, phosphine is oxidised by air. Phosphine is also far less basic than ammonia. 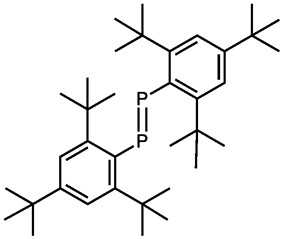 Other phophines are known which contain chains of up to nine phosphorus atoms and have the formula PnHn+2.The highly flammable gas diphosphine (P2H4) is an analogue of hydrazine. Phosphides arise by reaction of metals with red phosphorus. The alkali metals (group 1) and alkaline earth metals can form ionic compounds containing the phosphide ion ,P3-. These compounds react with water to form phosphine. Other phosphides, for example Na3P7, are known for these reactive metals. With the transition metals as well as the monophosphides there are metal rich phosphides, which are generally hard refractory compounds with a metallic lustre, and phosphorus rich phosphides which are less stable and include semiconductors. Schreibersite is a naturally occurring metal rich phosphide found in meteorites. The structures of the metal rich and phophorus rich phosphides can be structurally complex. The name Phosphorus in Ancient Greece was the name for the planet Venus and is derived from the Greek words (φως = light, φέρω = carry), which roughly translates as light-bringer or light carrier. (In Greek mythology and tradition, Augerinus (Αυγερινός = morning star, in use until today), Hesperus or Hesperinus (΄Εσπερος or Εσπερινός or Αποσπερίτης = evening star, in use until today) and Eosphorus (Εωσφόρος = dawnbearer, not in use for the planet after Christianity) are close homologues, and also associated with Phosphorus-the-planet). The dominant application of phosphorus is in fertilisers, which provides phosphate as required for all life and is often a limiting nutrient for crops. Phosphorus, being an essential plant nutrient, finds its major use as a constituent of fertilisers for agriculture and farm production in the form of concentrated phosphoric acids, which can consist of 70% to 75% P2O5. Global demand for fertilisers led to large increase in phosphate (PO43–) production in the second half of the 20th century. Due to the essential nature of phosphorus to living organisms, the low solubility of natural phosphorus-containing compounds, and the slow natural cycle of phosphorus, the agricultural industry relies on fertilisers that contain phosphate. A major form of these fertilisers is superphosphate of lime, a mixture of two salts, calcium dihydrogen phosphate Ca(H2PO4)2 and calcium sulfate dihydrate CaSO4·2H2O, produced by the reaction of sulfuric acid and water with calcium phosphate. White phosphorus is widely used to make plasticizers, flame retardants, pesticides, extraction agents, and water treatment. kerosene and used to extract uranium in the Purex process applied in the reprocessing of spent nuclear fuel. 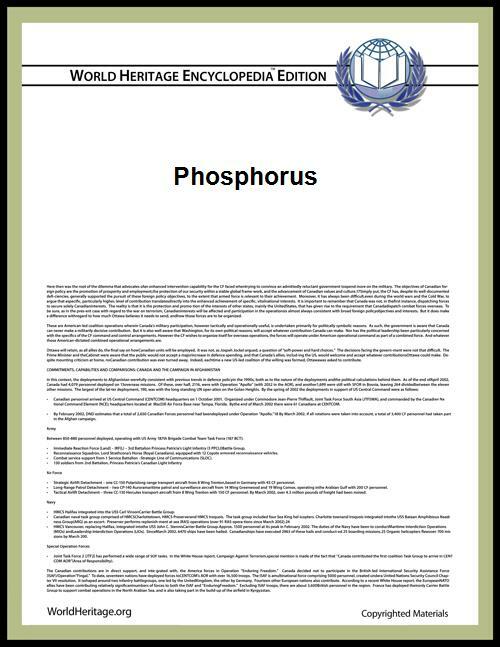 Phosphorus is an essential ecosystems an excess of phosphorus can be problematic, especially in aquatic systems, resulting in eutrophication which sometimes lead to algal blooms. 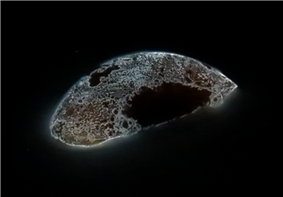 ^ This quote uses the word "phosphorescence", which is incorrect; WP, (white phosphorus), exhibits chemoluminescence upon exposure to air and if there is any WP in the wound, covered by tissue or fluids such as blood serum, it will not chemoluminesce until it is moved to a position where the air can get at it and activate the chemoluminescent glow, which requires a very dark room and dark-adapted eyes to see clearly. ^ Ellis, Bobby D.; MacDonald, Charles L. B. (2006). 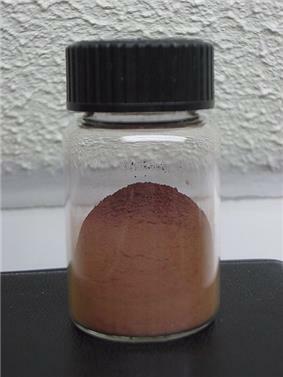 "Phosphorus(I) Iodide: A Versatile Metathesis Reagent for the Synthesis of Low Oxidation State Phosphorus Compounds". Inorganic Chemistry 45 (17): 6864–74. ^ Magnetic susceptibility of the elements and inorganic compounds, in Lide, D. R., ed. (2005). CRC Handbook of Chemistry and Physics (86th ed.). Boca Raton (FL): CRC Press. ^ a b c d Philpott, Tom (March–April 2013). "You Need Phosphorus to Live—and We're Running Out". Mother Jones. ^ a b A. Holleman, N. Wiberg (1985). "XV 2.1.3". Lehrbuch der Anorganischen Chemie (33 ed.). 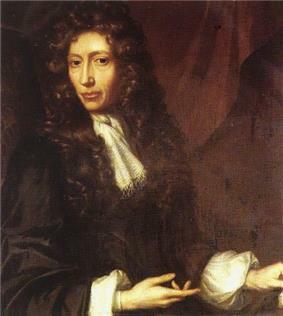 de Gruyter. ^ a b c Berger, L. I. (1996). Semiconductor materials. CRC Press. p. 84. ^ Simon, Arndt; Borrmann, Horst; Horakh, Jörg (1997). "On the Polymorphism of White Phosphorus". Chemische Berichte 130 (9): 1235. ^ a b c d e f g h i j k l Greenwood, N. N.; & Earnshaw, A. (1997). Chemistry of the Elements (2nd Edn. ), Oxford:Butterworth-Heinemann. ISBN 0-7506-3365-4. ^ Piro, N. A.; Figueroa, JS; McKellar, JT; Cummins, CC (2006). "Triple-Bond Reactivity of Diphosphorus Molecules". ^ a b Egon Wiberg; Nils Wiberg; Arnold Frederick Holleman (2001). Inorganic chemistry. Academic Press. pp. 683–684, 689. ^ a b c d Hammond, C. R. (2000). The Elements, in Handbook of Chemistry and Physics 81st edition. CRC press. ^ A. Brown, S. Runquist (1965). 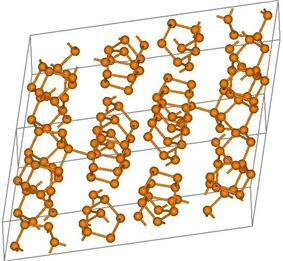 "Refinement of the crystal structure of black phosphorus". Acta Crystallogr 19 (4): 684. ^ Cartz, L.;Srinivasa, S.R. ;Riedner, R.J.;Jorgensen, J.D. ;Worlton, T.G. (1979). "Effect of pressure on bonding in black phosphorus". Journal of Chemical Physics 71 (4): 1718–1721. ^ Lange, Stefan; Schmidt, Peer and Nilges, Tom (2007). "Au3SnP7@Black Phosphorus: An Easy Access to Black Phosphorus". ^ "The Berkeley Laboratory Isotopes Project". Retrieved 2009-05-05. ^ "Phosphorus-32". University of Michigan Department of Occupational Safety & Environmental Health. Retrieved 2010-11-18. ^ "Phosphate Rock". USGS. Retrieved 2012-05-13. ^ Carpenter S.R. and Bennett E.M. (2011). "Reconsideration of the planetary boundary for phosphorus". Environmental Research Letters 6 (1): 1–12. ^ Reilly, Michael (May 26, 2007). "How Long Will it Last?". New Scientist 194 (2605): 38–39. ^ Wolgast, M (1993). Rena vatten. Om tankar i kretslopp. Uppsala: Creamon HB. ^ Morgan, Peter (2004). "10. The Usefulness of urine". An Ecological Approach to Sanitation in Africa: A Compilation of Experiences (CD release ed.). Aquamor, Harare, Zimbabwe. Retrieved 2011-12-06. ^ South African city looks to turn urine into fertilizer, UN Office for the Coordination of Humanitarian Affairs, November 2010. Sanitationfinance.org (2010-11-13). Retrieved on 2011-12-07. ^ water- and sanitation-related activities of GTZ – focus on ecosan projects. (PDF) Retrieved on 2011-12-07. ^ Ganrot, Zsofia (2005). Ph.D. Thesis: Urine processing for efficient nutrient recovery and reuse in agriculture. Goteborg, Sweden: Goteborg University. p. 170. ^ UDD-Toilets and urine management. (PDF). ecosanservices.org. Retrieved on 2011-12-07. ^ M. Johansson; Jönsson, H.; Höglund, C.; Richert Stintzing, A.; Rodhe, L. (2001). "Urine Separation – Closing the Nitrogen Cycle" (PDF). Stockholm Water Company. ^ Mara Grunbaum Shown to be an effective agricultural fertilizer, Scientific American, July 2010. Retrieved on 2011-12-07. ^ Kutzelnigg, W. (1984). "Chemical Bonding in Higher Main Group Elements". Angewandte Chemie Int. (English) Ed. 23 (4): 272–295. ^ John Emsley (7 January 2002). The 13th Element: The Sordid Tale of Murder, Fire, and Phosphorus. John Wiley & Sons. ^ Beatty, Richard (2000). Phosphorus. Marshall Cavendish. p. 7. ^ J. M. Stillman (1960). The Story of Alchemy and Early Chemistry. New York: Dover. pp. 418–419. ^ a b c Emsley, John (2000). The Shocking History of Phosphorus. London: Macmillan. ^ Lewis R. Goldfrank, Neal Flomenbaum, Mary Ann Howland, Robert S. Hoffman, Neal A. Lewin, Lewis S. Nelson (2006). Goldfrank's toxicologic emergencies. McGraw-Hill Professional. pp. 1486–1489. ^ "Phosphorus Topics page, at Lateral Science". Retrieved 2009-05-05. ^ Charnovitz, Steve (1987). "The Influence of International Labour Standards on the World Trading Regime. A Historical Overview". International Labour Review 126 (5): 565, 571. ^ Dockery, Kevin (1997). Special Warfare Special Weapons. Chicago: Emperor's Press. ^ Bernhardt, Nancy E.; Kasko, Artur M. (2008). Nutrition for the Middle Aged and Elderly. Nova Publishers. p. 171. ^ Anderson, John J. B. (1996). "Calcium, Phosphorus and Human Bone Development". ^ "US Navy's Treatment of Chemical Agent Casualties and Conventional Military Chemical Injuries: FM8-285: Part 2 Conventional Military Chemical Injuries". Retrieved 2009-05-05. ^ Skinner, H.F. (1990). "Methamphetamine synthesis via hydriodic acid/red phosphorus reduction of ephedrine". Forensic Science International 48 (2): 123–134. ^ "21 cfr 1309". Retrieved 2009-05-05. Emsley, John (2000). The Shocking history of Phosphorus. A biography of the Devil's Element. London: MacMillan. Podger, Hugh (2002). Albright & Wilson. The Last 50 years. Studley: Brewin Books. Simon, Fa; Pickering, Lk (1976). """Acute yellow phosphorus poisoning. "Smoking stool syndrome. JAMA: the Journal of the American Medical Association 235 (13): 1343–4.